Sarens Nass Middle East (SNME), a joint venture between Nass Group of Bahrain and Belgium-based Sarens NV, said it has executed a record-setting lift at the Kuwait National Petroleum Company (KNPC) refinery, which is implementing a clean fuels project (CFP). 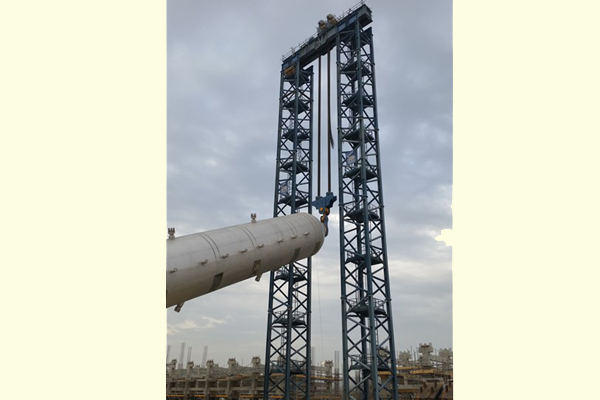 The Bahrain-based company used its Sarens Climbing Towers (SCT) and strand jacks to lift the 1,500-tonne reactor onto its foundation. KNPC's clean fuels project involves the upgrade and integration of the Mina Abdulla and Mina Al Ahmadi refineries. The Mina Abdullah Refinery and Mina Al Ahmadi Refinery revamp plan was part of a strategy to upgrade the oil refining industry in Kuwait. A study commissioned by KNPC found that the country needed liquid fuel to feed its power-generation plants and other installations in order to fulfill the country's demand for petroleum products and create stable foreign markets for Kuwait exports of high-grade petroleum products. To provide such liquid fuel, Mina Al Ahmadi and Mina Abdullah refineries needed to be expanded. On completion of the project, the combined capacity of the refineries will increase from the existing 736,000 barrels per day to 800,000 barrels per day, and will lower the sulphur content of petroleum products to five per cent. The project is scheduled for completion in mid-2018. Sarens undertook the task of lifting the 1,500-tonne reactor for the KNPC-led CFP at the Mina Abdullah refinery. The extraordinary aspect of the job was the unique set-up in which the towers were installed, completely intertwined with the adjacent reactor's bolting pattern. This allowed for a shorter lifting beam, cancelling all needs for a guyed tower system, ultimately resulting in a faster and safer execution. Sarens deployed its Sarens Climbing Towers (70 m high), CC8800-1 (in SSL configuration), CC2800-1, and LR1250. The cranes took two weeks to be assembled and were then ready to execute the lift. "It was a first lift of its kind on a KNPC site having a record setting performance. Our 25 skilled operations staff executed the challenge with utmost precision leading to a satisfied client," said a company spokesman. The major challenge faced by the team was to intertwine the SCT system with the next neighbouring reactor's bolting pattern within a limited space. Moreover, the weather conditions were very challenging, but the team successfully performed the operations, he stated.